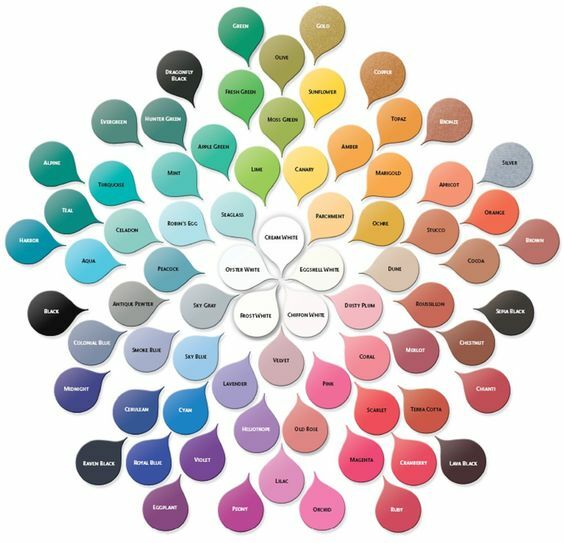 Congrats to Carolyn, the newest Featured Stamper (FS521) on Splitcoast! She has a wonderful gallery & I really fell for THIS one. 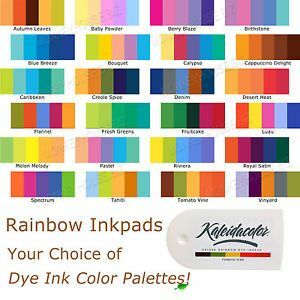 I liked the matching border & embossing folder but since I don’t have any like that, I used a different folder, different image & made mine monochromatic instead of rainbow colors. 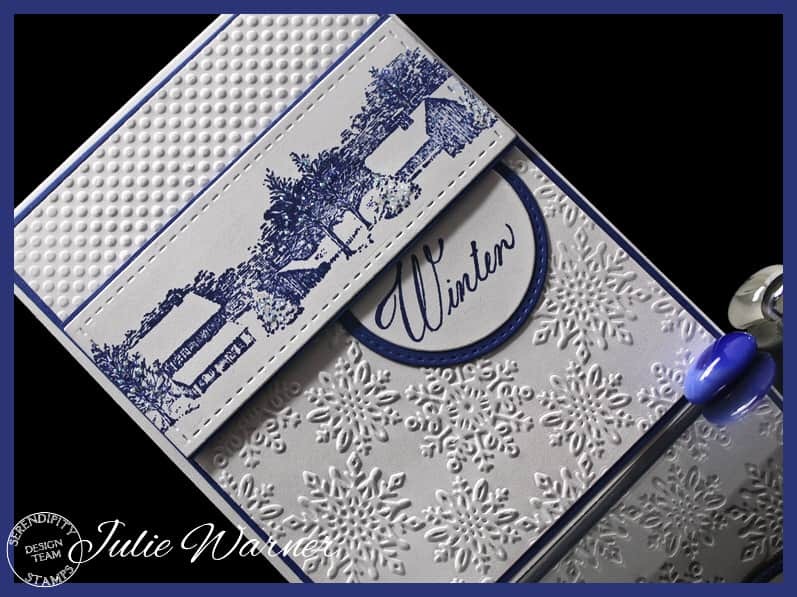 My winter card has a white background embossed w/ a folder that has the dots on top & snowflakes below. The folder has a blank band in between the two, but it’s covered up by my image panel. The image was stamped w/ the navy blue ink onto a stitched panel & I added just strips of the dk blue card stock on top & bottom. Only the first part of the greeting was stamped on a white circle & backed w/ a dk blue stitched circle. Just a little stickles was added on the trees for some winter sparkle. Here’s the inside…I must apologize for how blotchy it looks. I was anxious to get it in the mail & already wrote a message inside before I took the picture. The picture suffers some from photo editing to try to blot it out, lol. 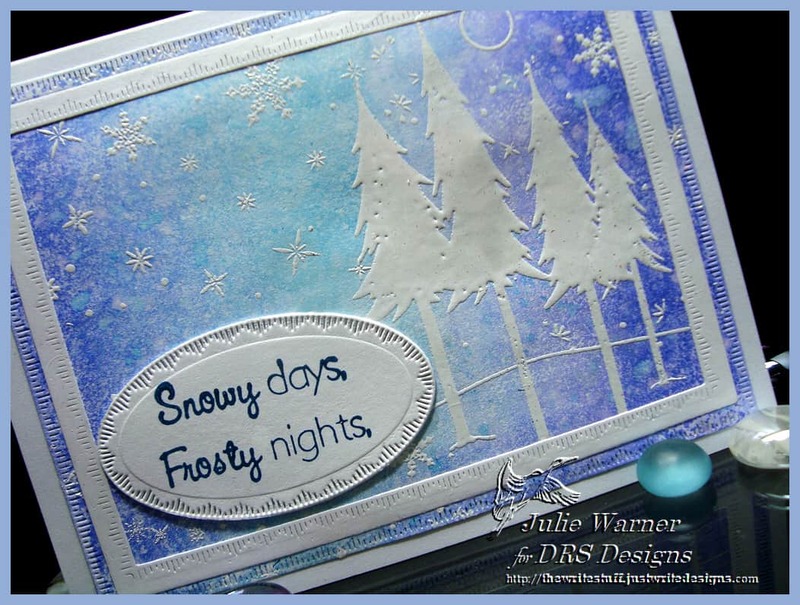 Today’s Mixed Media Challenge (MIX209) asks us to Make it Frosty. While it may look a little simple, believe me, there’s a lot going on here. 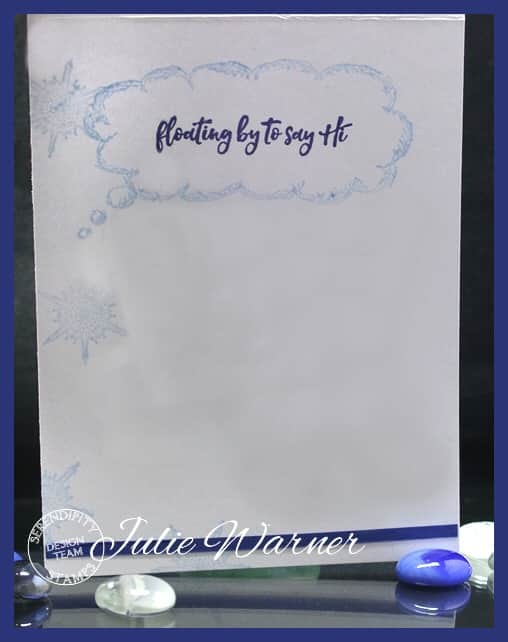 First I brayered a really large acrylic block using a blues rainbow pad, spritzed the block w/ water, then smushed it around w/ a water brush & stamped it onto the card stock. Sort of a variation on Wrinkle Free Distress. After it dried a little, I spritzed it w/ a spray I made w/ thinned white acrylic paint. Then the trees & snowflakes were white embossed on top. Well…my Wrinkle Free Distress was wrinkle free until I heat embossed. 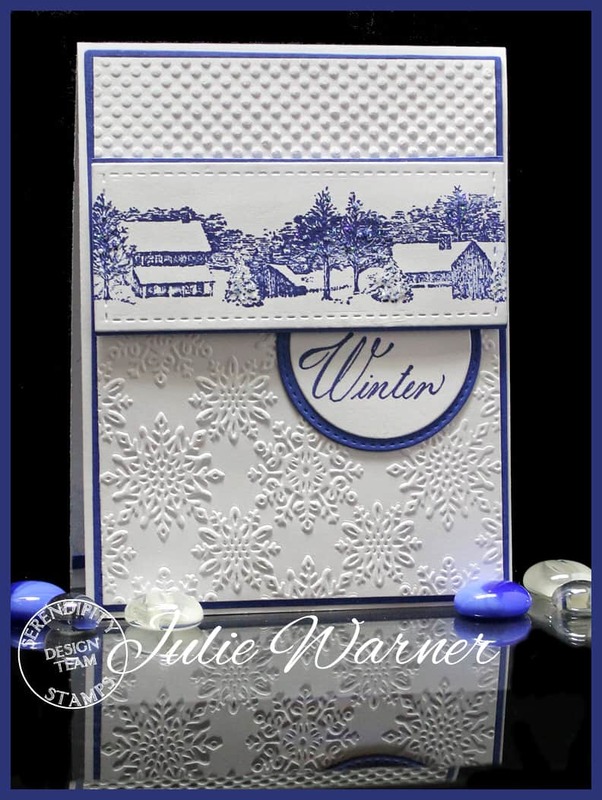 😉 I added a white die cut frame & half of the Snowy Days greeting on an oval. 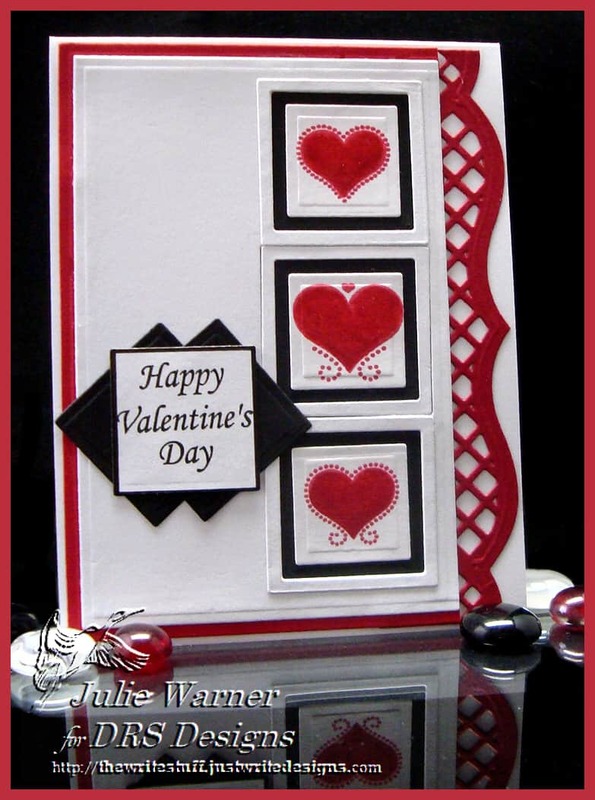 Today’s Sketch Challenge (SC629) on Splitcoast looked fun & I only made a couple of small adjustments by moving the hearts onto the squares & adding the greeting off to the side. 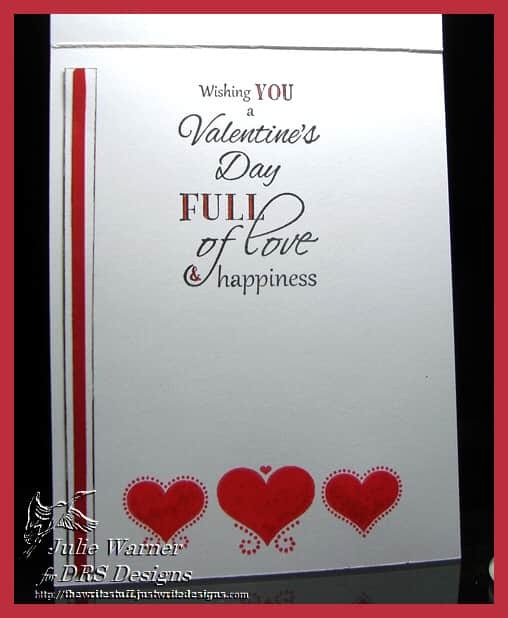 To make my Valentine card, I stamped the 3 hearts on little squares. Then I die cut larger squares out of the white front layer & backed them with black. They seemed to need a little something, so I die cut little frames out of white & put them on top of the cutout squares. 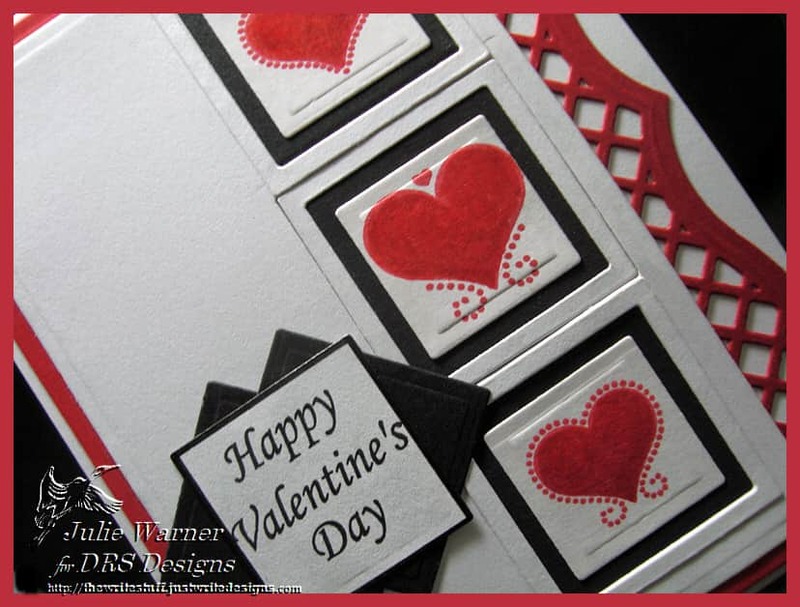 I had the red die cut border on the right already in my stash & I thought it accented the other colors perfectly. The greeting was stamped on another square & backed with a couple of black squares turned on an angle.